FS: SEIKO 6150-7001 June 1969, Serviced. The largest independent, non-commercial, consumer-oriented resource on the Internet for owners, collectors and enthusiasts of fine wristwatches. Online since 1998. Seiko 6159-7001 from 1969 in great original condition. The 6159a movement was serviced this summer and has 6 months mechanical warranty remaining. New seals were fitted last week by 'The watch Bloke' (Duncan) and a 10 bar pressure test was passed. The dial lume is 100% original and does show some darkening at 12. I prefer to leave the dial as original as possible as these are becoming harder to find. The case is sharp and unpolished and comes on a new uncle Seiko waffle. The case is unpolished and all parts are original to the watch, only the hands appear relumed. Even with the 10 bar test and service this is still a 50 year old watch, I therefor recommend that it is not used for diving. The warranty is mechanical only and does not include accidental/water damage etc etc. £5150 GBP Net plus shipping/full insurance. UK RMSD £20, EU £35 ROW £40 FEDEX. The 300m 6159-7001 (and 7000) diver is seikos first proper attempt at a “professional” dive watch. 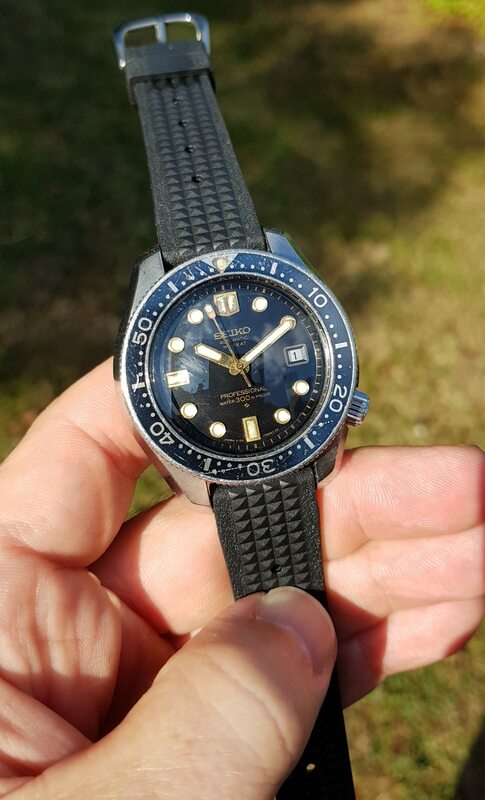 There was of course the 300m 6215-7001 which was released a year earlier in 1967, and the 150m 6217-8001 released in 1965, but according to the seiko parts catalogue of the time these two models are listed as a divers watches and the 6159-7001 is listed as a professional divers watch. Of course another clue is the fact the 6159 has ”professional” printed on the dial and the 6215 doesn’t! The 6215 and 6159 cases are very similar, both are monocoque and both share the same dimensions but the 6215 has a larger diameter crystal and slightly different bezel. It’s inside where the biggest changes are, instead of the 6215’s 35 jewel 19,800bph movement it has the beautiful 6159a movement, the 25 jewel, 36,000bph masterpiece that allows the seconds hand to almost glide around the dial. The case style and distinctive lines continue to this day in seiko’s sbdx001 more commonly known as the MM300. Re: REDUCED FS: SEIKO 6150-7001 June 1969, Serviced. REDUCED: FS: SEIKO 6150-7001 June 1969, Serviced.